In automotive tech, the idea of a head-up display (or HUD) is one that should be fully realised by now. You peer out past the steering wheel and see a floating display with your speed, current playlist, and even markings that show the lane-departure warning system is activated. Jet fighters have used HUDs for years, and holographic technology can now make the deceased rapper Tupac appear at a concert, so why not add HUDs to cars? Of course, there is a reason for the delay: some drivers can't stand anything blocking their view. Yet, with fidelity improvements, options for brightness level and location, and added instrument panel data, the HUD might finally make a debut in the family car in the next few years. Otherwise, the indicators are not as advanced as the BMW 3 or the Lexus GS, but they do show your speed, navigation instructions and audio info. The HUD in the Buick LaCrosse has many of the same features as the one found in the Lexus GS and the BMW 3, but adds a few interesting twists. There's the typical speed indicator and turn-by-turn navigation arrows, but you can also see whether your lights or turn signals are activated, see an icon for an incoming call, check the compass and even see the outside temperature. Not all of these settings are available at once, and a few appear intermittently. Like most GM cars with an HUD, you can adjust the brightness level of the HUD and the location (up or down), but the HUD doesn't sense ambient light. The 2012 BMW 3 series has a more advanced HUD than most cars. You can see your current speed, but the 3 x 6-inch colour display also shows any vehicle warnings (such as lane departure), your current setting for adaptive cruise control (the sensor that adjusts your car's speed relative to the car in front of you), and navigation indicators. Unlike the Lexus GS, though, the HUD in the BMW 3 will adjust automatically to current weather conditions: on a sunny day or dim overcast conditions, you don't need to adjust the brightness indicator, because the HUD adjusts for ambient light automatically. Here's a twist on the traditional HUD for speed and navigation. On the 2013 Ford Fusion, if you are in a pre-crash condition, and the car has already slowed the engine and started to apply the brakes automatically, you see a red line appear in the HUD as a warning to start braking. The Fusion will also chime to get your attention. 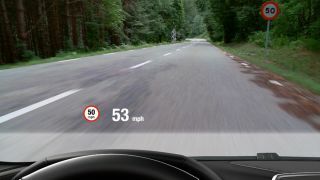 The concept of an HUD used only for collision warning is a nod to those drivers who get distracted by the usual HUD display with normal drive info and only need a warning. With one of the most advanced HUDs on the market, the 2013 Lexus GS shows your speed and a bar for measuring the eco mode of the car – or how much fuel you are saving. If you switch the HUD to sport mode, you can see the RPM level to aid in manual gear changing. The GS can also show turn-by-turn navigation, including an arrow that directs you for the next turn. You can see radio stations, and check whether you have enabled lane-keeping assistance. But the most interesting use of the HUD has to do with pre-collision detection. The HUD will flash BRAKE! all in caps if you are about to crash.